How often do “Can’t Miss” prospects miss? I previously stated that “no prospect is risk-free”. Today we’ll look into just what that means. 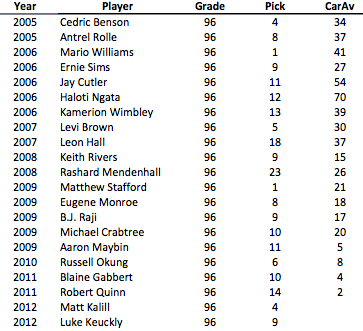 I went back through every draft from 2005-2011 and compiled the Scouts Inc. grades on each player taken in the first round. 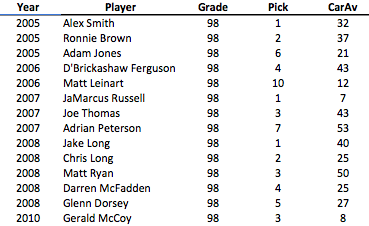 According to the Scouts Inc. grading scale, any prospect with a 90+ grade projects as a potential “elite player”. Recognizing that 10 points on a 100 point scale is a pretty big range, I will only look at prospects rated 95 or better. Theoretically, these players should be the absolute best of the “elite” prospects and should carry a very low miss rate. We’ll look at each rating and assign players to 1 of 3 categories: Hit (Those who can be considered elite players), Bust (completely non-productive players), and everyone else. Forewarning, I’m going to err on the positive side but feel free to assign your own if you disagree. At the end, we’ll total up the categories and see what happens. Note: These types of breakdowns typically devolve into parsing Hits/Busts, as everyone will have their own opinions on which players belong in which categories. This is not my goal. My hope is that while there will be disagreements over a few of the ratings, the overall numbers will provide useful insight. Remember, this is not an individual player analysis, it’s an attempt to draw insight into the broader “elite prospect” pool. One or two ratings changes won’t matter that much. Also, we are much more interested in the “Busts”, so moving players from “Hits” to “Everyone Else” or vice-versa doesn’t really effect what we are looking at. Hits: Aaron Rodgers, Calvin Johnson, Andrew Luck (a bit early but remember we’re being generous). In looking at those totals, it’s clear that there is actually a difference in success odds for each discrete rating, which really surprises me (though it’s hardly enough data to confirm). In general, there is a clear decrease in Hit odds and corresponding increase in Bust odds as you move from 99 to 95. However, it also clearly shows what I was originally hoping to illustrate: There is no such thing as a risk-free prospect. I realize that none of the 99s rated as busts, but since there are only 5 of them, and given the Edwards and Bush careers, I think its safe to say we will see a 99 bust at some point. In total there were 93 prospects included that rated 95 or better. 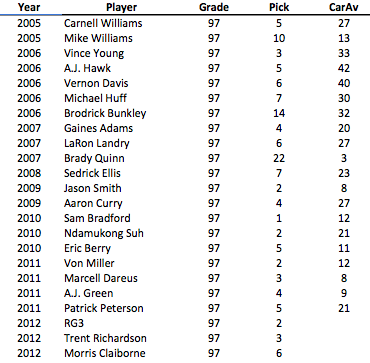 Of these, I rated 16 18 as Busts, or 19.35%. 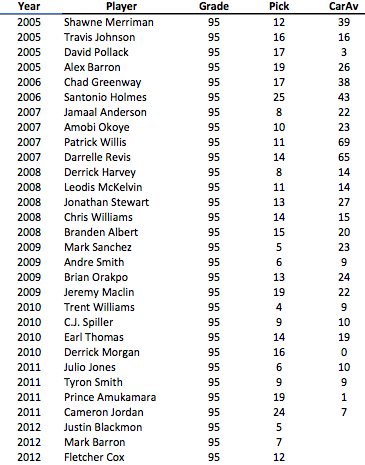 So examining the absolute best of the best prospects, almost 20% of them end up busting. I realize this is a very subjective breakdown, but even with a few changes either way, the overarching point remains, even the best prospects have a significant chance of complete failure. My bad. Definitely meant to list both of them as busts. Just an oversight on my part.